◎ Xue Yinxian’s defection is a high-profile example of the Chinese people’s growing loss of confidence in the Communist Party. 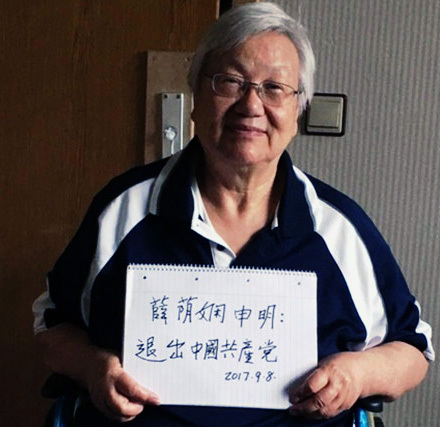 Xue Yinxian, a retired Chinese doctor, athletics doping whistleblower, and relative of Communist Party vice-chairman Li Yuanchao, recently sought political asylum in Germany with her family and publicly withdrew from the Party (tuidang). Xue, her husband, and her son were persecuted after she exposed the Party’s practice of giving athletes performance-enhancing drugs before the 2012 London Olympics to Western media. Why it matters: Xue Yinxian’s defection is a high-profile example of the Chinese people’s growing loss of confidence in the Communist Party. After The Epoch Times published the editorial series, “Nine Commentaries on the Communist Party,” in November 2004, Chinese citizens started renouncing their affiliation with the Party in droves. An underground movement to withdraw from the Party, or “tuidang” was born, and over 280 million Chinese inside and outside China have since publicly cut ties with the Party and its affiliated organizations, the Young Pioneers and Youth League.